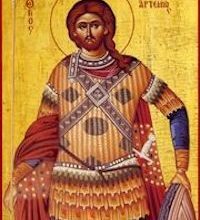 Though many Greek Orthodox Christians don’t know it, every day in the week we celebrate a different celebration. On Sunday we remember Pascha (Easter)! For us it is both the first and last day of the week, the 1st day of Creation as well as the “Eighth Day,” the new creation in the Resurrection. Sundays are always focused on the Resurrection of Jesus Christ. On Monday we remember all the Angels (Thrones, Cherubim, Seraphim, Authorities, Dominions, Powers, Angels, Archangels and Principalities). We say, “Holy Archangels and Angels, pray to God for us.” It has even been said that on rare occasions some people see angelic hosts, such as the Abraham in the Old Testament, the Virgin Mary who was greeted by the Archangel Gabriel, and the many stories of the intercessions of the Archangel Michael. 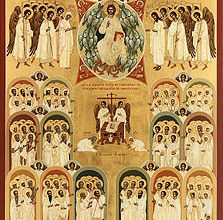 Though we forget about angels most of the time, their images cover our churches and are typically shown on the two “Deacon Doors,” the left and right doors of the Iconostasion (icon screen). On Tuesday we remember St. John the Baptist and Forerunner, the cousin of Jesus who was preparing the people for His coming. 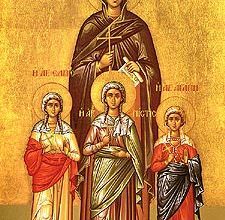 St. John is also seen as the beginning of Orthodox Monastics, so in a way we are not only celebrating St. John but also all Orthodox Monks and Nuns. On Wednesday we remember the Betrayal of Judas, where he turned Jesus over to the Sanhedrin for thirty pieces of silver. The Church calls us to fast on this day to keep it solemn and to remember this event. On Thursday we remember the Apostles and St. Nicholas of Myra. The Apostles were the eleven who closely followed Jesus and had a close and special relationship with our Lord and Savior (I say eleven, because Judas hanged himself before the crucifixion). St. Paul is also considered an Apostle, even though the other Apostles replaced Judas with Matthias. Many of them became the first Bishops of the Church. 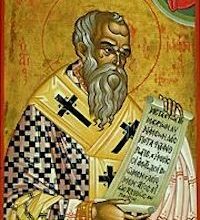 St. Nicholas is also remembered on this day for being a bishop. St. Nicholas is considered the ideal bishop. On Friday we remember the Crucifixion. This was the day that Christ was hung on the Cross for our salvation. Don’t be confused by the structure of Holy Week where we first see Jesus on the Cross on Holy Thursday Evening, we move everything up in anticipation of Pascha. On Holy Thursday Evening, we are actually celebrating Holy Friday’s morning service. Like Wednesday, the Church prescribes us to fast on Friday’s due to the solemnity of the remembrance of the day. On Saturday we remember the Dead. This is the day that Christ’s body laid dead in the tomb. This day used to be the day for Koliva (boiled wheat) to be brought to Church to remember the dead, and not Sunday as practiced in modern times. Special Saturdays, mostly around Lent, are called Saturday of the Souls, where Liturgies are offered specifically for the dead and it is traditional for many people to bring their Koliva’s.